Download DA Form 8001, also known as Limits Of Confidentiality. 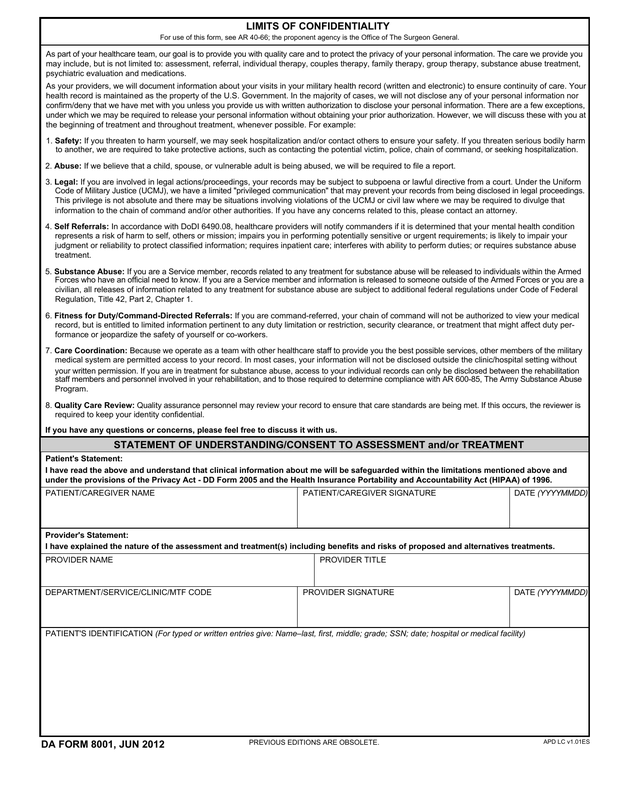 This form is part of what will be discussed while a member of military personnel is seeking a mental health evaluation. This same form is used for a counselor or psychiatrist to evaluate potential alcohol and/or drug addiction. Step 1 – Read this form in it’s entirety. Paragraph one explains that the care they will provide may include assessments, referrals, several level of different therapies and/or alcohol or drug treatment. Paragraph two explains the limits of liability which they will discuss with you from the beginning so that you will be able to protect your privacy and make an educated decision into exactly what sort of information may or may not be protected. 1.- Safety – Discusses threatening harm to yourself – it must be reported. 2. Abuse – Discusses the fact that if your team believes there is a threat to children, spouse or a vulnerable adult – they will be required to make a report. 3. Legal – If you are involved in a legal action/proceeding, a patient’s records may be subject to subpoena or a lawful directive from a court of which the military will comply. 4. Self Referrals – In accordance with DoDI 6490.08 healthcare providers will report to commanders if it is determined that your mental health condition represents a risk to yourself, others or a mission. 5. Substance Abuse – Discusses the fact that if you are a service member, records related to treatment for substance abuse will be released to members of the Armed Forces who have an official need to know. 6. Fitness For Duty/Command-Directed Referrals – If you are command-referred, your chain of command will not be authorized to view your medical record, but is entitled to limited information as needed. 7. Care Coordination – Because those who will treat you, act as a team, other members of medical military are permitted access to your records. 8. Quality Care Review – Quality assurance personnel may review your record to ensure that care standards are being met.